In our continuing effort to improve our webpage and services we would like your feedback, testimonials and pictures. 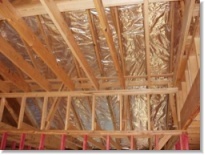 Send us your radiant barrier pictures or testimonials. If we decide to use them on our webpage or literature, we will send you three of our new energy saving night lights, a $14.99 value. It is always interesting to see the different ways in which our customers use our products. We are looking for pictures of different types of Radiant Barrier installations (floors, walls, house wraps, etc) to use on our web pages and other promotional material. If you need your pictures returned, please include a self addressed and stamped envelope. If you wish, please feel free to include a story or feedback about your installation experience. Any information about difficulties encountered, lessons learned, or tips are welcome. As always, we also appreciate general feedback on energy savings, our services, or anything else you see which could help improve our service. Submitted pictures become the property of Energy Efficient Solutions. We reserve the right to use pictures and feedback at our discretion on web pages and other material. Any private information will be kept confidential. If you wish to be illegible for the free gift, please include your contact information.